As was the expectation leading into the clash between North Dakota State and James Madison, the national championship game became a defensive war. When the clock struck zero, it was the Bison who stood above the Dukes. 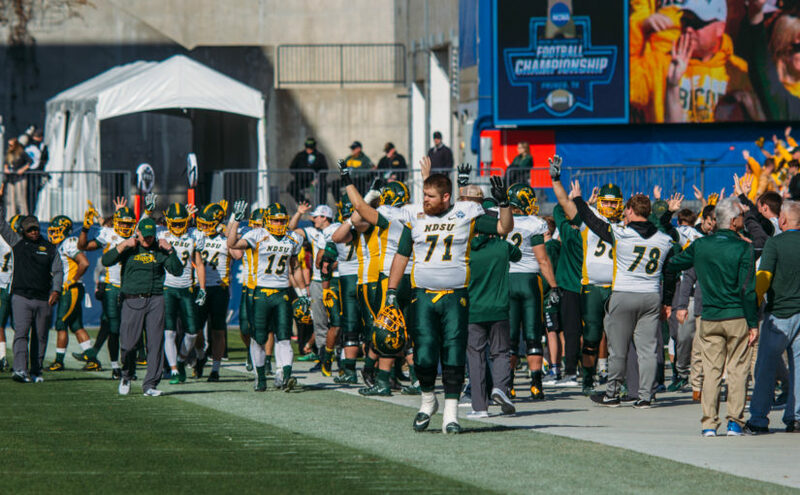 In silencing a team that had averaged 35.9 points per game, Code Green asserted their claim as the class of the FCS in resounding fashion, leaving a legacy of dominance. Sophomore defensive end Derrek Tuszka spearheaded the defensive master class. The Wagner, South Dakota native tallied six solo tackles, two tackles for loss and two sacks in the 17-13 triumph over James Madison. For Tuszka, it was his highest total in all three categories this season. The Bison’s strategy to quiet the JMU offense was to take away their running game and turn the Dukes into a passing team, an area of weakness. “It was a successful game plan,” he summarized. NDSU’s smothering run defense, which ends the season as the No. 6 in the nation, decimated James Madison’s running backs. Marcus Marshall, the Dukes’ leading rusher, was held to only 30 yards on 11 carries against the Bison. His 2.7 yards per carry were a far cry from his season mark of 6.2 entering the contest. The junior torched Weber State and South Dakota State in the playoffs for 128 and 203 yards, respectively, but could not hit pay dirt against the Herd. James Madison could not find any answers beyond Marshall. Fellow junior Trai Sharp could not do any better, rushing for only 20 yards. Punter Harry O’Kelly actually accounted for the Dukes’ longest rushing play of the afternoon, going 24 yards on their fourth quarter fake punt. Once the Bison forced James Madison to become a pass-first team, their secondary took over. Quarterback Bryan Schor was a shadow of his usual self, completing only 14 of 32 pass attempts for 148 yards, tossing two interceptions. The first of Schor’s two turnovers came in the second quarter with an opportunity for the Dukes to take their first lead in the contest. Trailing 7-3, JMU gained possession deep in Bison territory thanks to Simeyon Robinson’s sack and forced fumble. Three plays later, Code Green responded. Jarrod Tuszka spun the James Madison passer to the ground, and his errant throw went right to Nate Tanguay, who bent down to record his first career interception. Both Bridges and Josh Hayes made their first career starts in the National Championship game. Usual starters Jalen Allison and Jaylaan Wimbush were both held out due to injuries suffered against Sam Houston State in the semifinals. Bridges, a sophomore, matched up against wide receiver Riley Stapleton, who made seven catches for 107 yards. Still, Bridges blanketed the receiver on some plays, and his third quarter interception kept the Bison in front. After Stapleton’s 16-yard gain put James Madison in the red zone, Bridges made a big play of his own, picking off Schor at the 3-yard line to preserve the Bison’s 17-13 lead. Bridges and Hayes are only the two latest examples of the Bison’s next man up mantra on defense this season. When Nick DeLuca had to miss time in non-conference play, Dan Marlette stepped up. After Chris Board went down, Jabril Cox slid in and became NDSU’s next superstar on defense. In total, the Bison won the turnover battle against James Madison, who with 43 takeaways were the FCS’s kings at turning the ball over. Additionally, thanks in large measure to forcing the Dukes to four three-and-outs, NDSU out-possessed JMU by over a quarter of game time, keeping possession for 37:41.